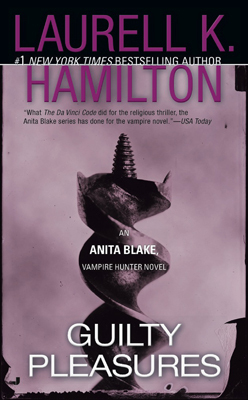 Vampire Hunter, Ma Petite, The Executioner, Animator, those are the many titles Anita Blake goes by. Pulled into a case where Anita is forced to find out who or what is killing master vampires, she can't help but keep those she cares about at bay. Bringing harm unto herself is one thing, but unto her friends? Not an option. There are a few things I liked & disliked about this book. What I disliked would have to be, while reading, there seemed to be a whole mess of characters being thrown in my face. I felt like every other page I was introduced to someone new & I was trying my damnedest to keep up & commit them to memory. A few times I had to step back, flip back a few pages (or chapters), flip back to the page I was reading, re-read that page and then finally remember who the hell Zachary, Phillip, Bert, Irving, Winter or Edward was, okay not Edward, because I liked him from the moment he was mentioned in the book. Now, what I did like, I liked when the book picked up it's pace and I started to get hooked. Despite the many characters, I felt they played their part and played it well. I loved the wererats, although I couldn't quite picture them in their were-form. I kept seeing rats running around, but some of the wererats in this book were huge. And I just couldn't see them being bigger than a shoe. I would recommend this book. Although, I do think it was kinda slow when it started, I did enjoy it and fled through the rest of the book once I was hooked. We'll see if I get that far. Thanks for stopping by, Braine! I've been rereading this series on audio and she does throw a helluva lot of characters at you in each book. This is a trend that doesn't end but after a few books she settles down and gets into a groove for several books with a love triangle. As the series continues to evolve Anita morphs into a very different person. Thanks for that :) I couldn't keep up with the number of characters being thrown at me. But I'm a trooper and pushed through it. Thanks for stopping by!